Kymera uses state of the art equipment in order to detect a wide variety of conditions that range from cardiac disease to cancers. This allows us to pinpoint the source of a condition and diagnose the severity and progression of a disease with greater accuracy. Best of all, there is no need for our patients to travel elsewhere for imaging services. This saves time but more importantly, reduces the stress associated with waiting. This, in turn better promotes healing, which is what we are all about. 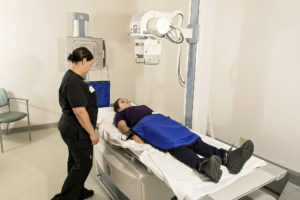 Nuclear medicine involves the use of small amounts of radioactive medications which are introduced into the body so that technologists can gather images from within. Such images are impossible using any other methods. The procedure involves having the patient receive the medication in advance. The medication, known as a radiopharmaceutical, may be swallowed, injected, or inhaled. Once in place, it emits low levels of radiation into nearby tissues. A gamma camera can then capture the images produced from the radioactive tissue and return important data to the treating physician. 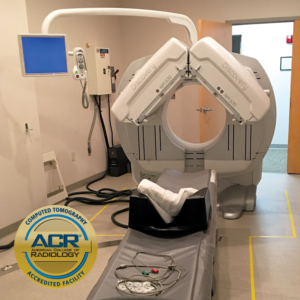 Our Nuclear Medicine machine is American College of Radiology (ACR) certified. ACR is at the forefront of radiology evolution, representing more than 38,000 diagnostic radiologists, radiation oncologists, interventional radiologists, nuclear medicine physicians and medical physicists. 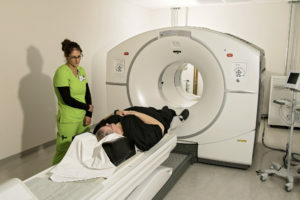 Positron emission tomography—computed tomography (PET/CT) is an imaging device that allows physicians to locate and determine the magnitude of cancer and other diseases residing in a patient’s body. Like X-Rays and Nuclear Medicine, the device relies on radiation to deliver images, but unlike the other systems, PET/CT can deliver three-dimensional views of organs or other internal tissues. The PET/CT is a two-part device: The scanner and the computer. 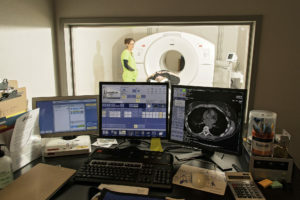 The two systems work together to deliver images, with the computed tomography (CT) scanner playing a key role in compiling the final imagery. The first PET/CT went operational in 1998 at the University of Pittsburgh Medical Center and within a few years hundreds were in use worldwide. Since then, the device has become an important part of understanding the size and scope of cancerous growth in patients. The Kymera PET/CT machine is the only stationary American College of Radiology (ACR) certified unit in Southeast New Mexico. Our facility and industry-leading physicians and technicians are highly qualified, supportive, and will make the testing process as comfortable as possible. Our x-ray imaging provides high-definition images. This allows us to make accurate treatment for our patients while still in our care rather than sending them elsewhere for the x-ray then back for treatment. Naturally, our patients love this for it saves considerable time and effort at a time when any effort is difficult. We also have the ability to determine an individual’s body composition with a DEXA (DXA) bone density scan. Also called dual-energy x-ray absorptiometry, bone densitometry involves the use of small amounts of ionized radiation to measure the density of bones. The most common use is to diagnose osteoporosis but may also be used to assess a patient with other conditions which may cause bone loss. The test can also be used to check one’s susceptibility to fractures. Take medications known to result in bone loss such as corticosteroids, certain anti-seizure medications, high-dose thyroid replacement drugs, and some barbiturates. Our highly qualified staff and state of the art equipment makes for an easy procedure. 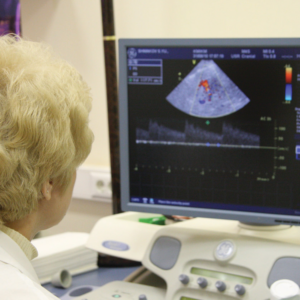 An echocardiogram (Echo) is a non-invasive way to look into the body using sound waves. Most today are familiar with the Ultrasound device. It is one of the most common tools seen by expecting parents, allowing them to observe the growth of their baby without causing any harm to the developing infant. Know the shape and size of a patient’s heart as well as measure the size and thickness of heart walls. Identify other abnormalities such as holes between heart chambers. Our skilled technicians use state of the art equipment to help diagnose heart conditions, view internal swelling, and assess damage after a heart attack. Each will take care to help you be as comfortable as possible during all procedures and will gladly answer any questions you have during the procedure. Without a unit like the Discovery NM 360 shown above, Nuclear Medicine would not be possible. When a PET/CT scan is needed, Kymera Imaging is ready with the latest equipment. When X-Rays are needed, there is no need to go elsewhere. Computed Tomography, or computer aided imagery, ensures the clearest images and the best diagnoses. At Kymera Independent Physicians, we pride ourselves on advanced, compassionate care and treatments. We hope we have been able to answer many of your questions about Imaging in general. If you are a patient or considering becoming a patient know that we are happy to answer all your questions to your satisfaction. We know that some imaging tests can be frightening or seem seem daunting. But know that we are here for you.